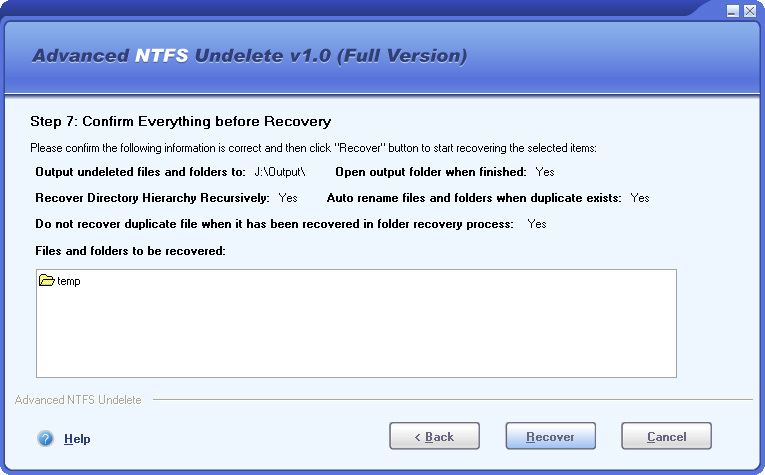 DataNumen Inc., a world leader in data recovery technologies, has released its new product - Advanced NTFS Undelete. This powerful tool is able to recover deleted files and folders on NTFS, which is the standard file system of Windows platform. Even if the user has permanently deleted the files by mistake or if the Recycled Bin has already been cleared, the necessary data can be recovered just in a couple of minutes. Actually, no one can feel secured against accidental file deletion. It is alright, if the file was moved to Recycle Bin, but what if it was deleted permanently? If the deleted data contains important information, it can cause the user a lot of trouble…To be more precise, it will be a problem if the user does not have Advanced NTFS Undelete. However, if he has a copy on hand, everything changes. He can use it to scan the NTFS drive and get a list of deleted files and folders that can be recovered. Then he just selects the files needed and starts the recovery process. Within several minutes he gets his files back. The point is that Advanced NTFS Undelete is based on thorough understanding of the NTFS file format system. That is why it works in the most effective way, recovering more data than competing products and, of course, much faster. 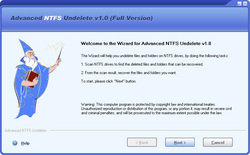 Moreover, Advanced NTFS Undelete provides users with a simple wizard, so that even novices can work with the program without any difficulties. Somebody may think they do not have problems with file recovery, because they always check the files to delete. But anyway, things happen. Moreover, somebody else can also accidentally delete valuable information from the PC when the user is away. What to do in such a situation, especially if that very file is required urgently? 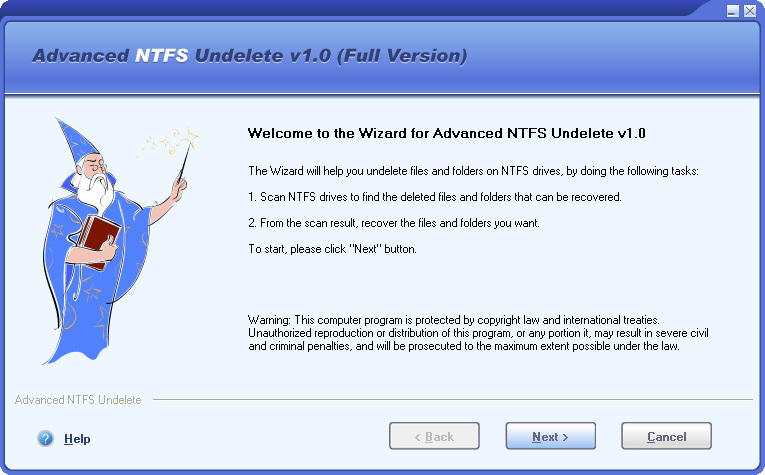 It would be wiser to get a copy of Advanced NTFS Undelete beforehand, just to be on the safe side. Filters and sorts the deleted files and folders according to specified criteria. Advanced NTFS Undelete runs under Windows 95/98/Me/NT/2000/XP/2003 Server/Vista/2008 Server.